The Yates Boys formed in the year 1970 by “Rico” at the corner of Francisco and Cortland in the Logan Square community, and they took their name from the Richard Yates Elementary School at 1839 N Richmond St that was right at that intersection. The YBOs adopted the colors of orange and blue based upon the Yates School colors. The Yates Boys were formed as protection from nearby gangs like Gaylords and Imperial Gangsters. In the same year of 1970, the Ghetto Boys was formed at Armitage and Humboldt Boulevard in Logan Square by “Red” for the same reasons as the Yates Boys, they both had major conflicts with Imperial Gangsters and Gaylords. Within a few years the Ghetto Boys changed their name to the Ghetto Brothers Organization (no affiliation to the Ghetto Brothers of New York City). As time went on the GBOs and YBOs became close allies and hung out regularly. Both groups also became allies with Warlords, Spanish Lords, Insane Unknowns and Latin Kings. In the year 1977, the GBOs and YBOs came together as one force to be reckoned with while still being led by the founders Red and Rico. Shortly after this combining of forces YBOs moved off of Francisco and Cortland as they battled YLO Disciples. YBOs moved to Armitage and Humboldt alongside GBOs. The Warlords, Insane Unknowns and Spanish Lords invited GBO/YBO into the United neighborhoods alliance in 1977. By the year 1978 the GBO/YBO now had about 300 members and became one of the bigger gangs in Logan Square. They now had the territories of Albany and Dickens, Cortland and Whipple, Dickens and Whipple, Armitage and Albany, Armitage and Humboldt, Cortland and Humboldt all under GBO control while Armitage and Whipple was YBO. In this same year GBOs ventured to Lawler and Thomas in the Austin neighborhood. This new neighborhood was settled by “Satan” who was said to be one of the craziest members of GBO. Austin was becoming a very tough neighborhood by the late 1970s as Vice Lords were rapidly pouring into the area and white greaser clubs were furious about blacks moving in. One of the most furious of entities was the P.V.R alliance consisting of Play Boys, Rice Boys and Ventures. The P.V.Rs became GBO’s biggest enemies in Austin. As this neighborhood would continue to become a mostly black community, most of the GBOs at Lawler and Thomas were black, the others were Puerto Rican. Lawler and Thomas was the craziest section of the GBO/YBO as legend has it that they were killers and quickly dealt with their opposition. In the year 1979, GBO/YBO would begin having flare ups with YLOCDs (Young Latino Organization Cobra Disciples) in the area near GBO/YBO. The YLOCDs were an offshoot of the ULO that only honored the alliance between Spanish Cobras and Latin Disciples, they were in the early stages of becoming their own gang by 1979 and eventually would become the YLO Disciples and YLO Cobras we know today, but in 1979 they were the YLOCD and they were gunning for GBO/YBO territory and causing problems at Armitage and Humboldt and this led to the February 28, 1979 shooting death of GBO member Fellipe Baez that was shot in the back and killed by YLOCDs as he was gunned down by the Gonzalez brothers according to court documents (IN RE GONZALEZ, 1981). This shooting sparked a major war not only between YLOCDs but also the entire Spanish Cobra and Latin Disciple nations which led to war with the entire ULO not just Imperial Gangsters that were ULO and right in the neighborhood. In the year 1981 GBO/YBO joined the People Nation alliance as soon as their closest ally the Latin Kings were sanctioned to let GBO/YBO in. Gaylords joined the People Nation that year the war with PGL now would stop. It was right at this time that GBO/YBO made an alliance with the Latin Brothers that had just moved into norther Austin and had joined the People nation the same year. 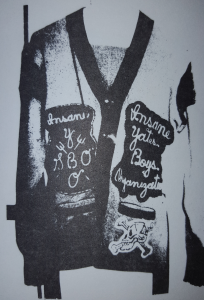 Joining the People Nation did not do much to help GBO/YBO as they started to decline in numbers beginning in the early 1980s but they still maintained a large enough gang to be a force to be reckoned with all throughout the 1980s. In the year 1987, the GBOs were fed up with the Latin Kings because the Kings of Armitage and Kedzie were messing with GBO turf and trying to control the drug trade in GBO hoods, this angered the gang but they were heavily outnumbered by the Kings and of course the Folks. The GBOs then agreed to hold a meeting with the Insane Deuces and the P.R. Stones to discuss a war with Latin Kings and maybe a possibility of switching to Folks, the Deuce leader “Blade” held the meeting because Kings were trying to take over the Deuce controlled Lathrop projects. The three gangs made an agreement to launch the interalliance war but P.R. Stones and GBOs did not follow through and decided it was not a good idea. The legendary section of Lawler and Thomas had to close in 1987 as now the neighborhood had become completely overran by Vice Lords and Four Corner Hustlers. Although these organization were allies to GBO/YBO it still was not a good area for GBO/YBO to operate in any longer. All GBOs and YBOs closed all their sections in 1987 and moved to Whipple and Dickens in the Logan Square area. By the early 1990s the GBO/YBO were now at war with Latin Kings as friction turned into full scale war. GBO/YBO had zero tolerance for Latin Kings disrespecting them even though they were both allied with the People nation and the United Neighborhoods. In 1992, the United Neighborhoods was disintegrated when Spanish Lords and Insane Unknowns went to war so there was nothing binding the Latin Kings with GBO/YBO anyway. Tragic deaths plagued GBO/YBO as their founders Red and Rico were both killed and violent revenge was plotted against the Latin Kings that brought the death of King Monk of the Latin Kings in 1994. With all the war and death going on the GBO/YBO decided to retire in the year 1994 and Whipple and Dickens closed down.